Mathieulh, RichDevX, graf_chokolo, N_D_T, and TitanMKD release the Lv2ldr keys for the PS3. Project #PS3bluray release tool that are aimed at fixing the Blu Ray problem caused by downgrading. Eboot.bin released for GT5, to make it playable on 3.41. AerialX releases SCEkrit v1.0, a key generator for Sony’s private keys. KaKaRoTo releases the first MFW(Modded Firmware). BBC News reports on the keys released by GeoHot. Sony responds to the previous days hacks, by stating that it plans to fix recent PS3 security breaches through a series of network updates. In an interview with BBC, pytey from fail0verflow, said that the removal of the OthereOS feature, was their motivation to hack the machine. “Anonymus” releases the source code for his PSX(PS1) Emulator for PS3. KaKaRoToKs tweets that he and Xtse have found a successful method for downgrading from 3.55 to 3.41. GeoHot releases his 3.55 Jailbreak, now people can enjoy Homebrew on 3.55 using his method, read about it here, this method prevents the ability to play backups. KaKaRoTo compiles and releases a linux version of RCOMage. GeoHot releases his Homebrew signing tool, Homebrew can now be signed to run with his homebrew. BazGee sign and release the first homebrew for 3.55, which was an early version of the Snes Emulator. FamousMassacre releases an app to sign packages. ‘Sony has recently acknowledged a breach in security on the PS3 which has resulted in the hardware and its games to become exposed to exploits and hacks. Modern Warfare 2 is no exception to this security exploit and we understand that some of you have experienced problems with stats and other issues associated with this. hermes release his MFW for PS3 owners who were still on firmware 3.41.
rms releases “PS3 Model Detection”, a handy little homebrew app that gave you information on your console. Geohot Lawyers Move for Dismissal and Sony’s response to that, you can read more about that here. In an interview with ComputerAndVideoGames, Valve state they are not woried about the PS3’s security being breached and said it wont affect Portal 2.
eustolio releases a tutorial, to make custom boot logo’s and custom dynamic themes, read about it here. NGP, the successor to PSP is announced. GeoHot gets served a TRO(Temporary Restraining Order), read about it here. System security has been improved, blocking the ability to run unauthorized software. Added an Ipla TV channel under [TV] for Poland. Downloaded demos are no longer collapsed in a folder. Jan 27 14:45:00 RFE built-in the fw!? Jan 27 14:45:43 psn rootkit ? News emerges, that players who used 3.55 MFW and Comgenies Awesome Filemanager, to install patches in order to cheat at Black Op’s were being banned from the Black Op’s servers. Code repository site, GitHub receive DMCA notices, to remove all files relating to the hacking of the PS3, read about that here. Kotaku report on a rumour, suggesting that PS3 users will be able to upload their game saves to a cloud server. Waninkoko releases version 2 of his MFW, this time around his release was more of a success. JaicraB Releases Patched LV2Diag, to skip blu-ray drive during updates, the signicance of this patched LV2Diag.elf is that it no longer looks for the Blu Ray drive on your PS3, so when downgrading/upgrading the PS3 firmware we no longer loose the BluRay playback functionality. It also allows those of you with a broken/missing BluRay drive to upgrade/downgrade your console firmware as well. Rumours start circulating that official firmware 3.56 has been hacked. Sony release a patch to their firmware. 3.56v2 fixed problems regarding upgrading of the HDD. graf_chokolo states that he will return OtherOS, read about it here. Several court documents are released by PSX Scene, which show that Sony are looking for more hackers, they include Waninkoko, kmeaw, KaKaRoTo and graf_chokolo, Sony also wish to subopena hacking sites like PSX-Scene and other sites such as YouTube, Twitter, PayPal and Slashdot, you can read about that here. kmeaw releases v1.2 of his version of AsbestOS. Sony’s Kevin Butler accidentally retweets the Jailbreak rootkey. News emerges, that GeoHot is forced to hand over his harddrives. kmeaw releases v1.4 of AsbestOS. GeoHot releases a rap video via his Youtube channel. It emerges, that Killzone 3 has been leaked, two weeks before its release date. The PS3MFW guys(KaKaRoTo and a few that want to remain anonymous) release PS3MFW Builder v0.1, a peice of computer software which lets non devs create MFW. Dev_Blind 1.0 is released, it lets people on MFW 3.55 write to dev_flash. Sees the release of graf_chokolo’s Linux Kernel v2.6, it gives Full RAM Access, New HV calls, and more. KillerBug releases a tutorial on how to create a DIY fan controller for the PS3, you can find that tutorial here. PSGroove member drizzt releases a tool/method for bypassing the block Sony put on PSN, for users who didnt update to 3.56, he calls it f**kPSN. Notice: Unauthorized circumvention devices for the PlayStation 3 system have been recently released by hackers. These devices permit the use of unauthorized or pirated software. Use of such devices or software violates the terms of the “System Software License Agreement for the PlayStation 3 System” and the “Terms of Services and User Agreement” for the PlayStation Network/Qriocity and its Community Code of Conduct provisions. Violation of the System Software Licence Agreement for the PlayStation 3 System invalidates the consumer guarantee for that system. In addition, copying or playing pirated software is a violation of International Copyright Laws. Consumers using circumvention devices or running unauthorized or pirated software will have access to the PlayStation Network and access to Qriocity services through PlayStation 3 system terminated permanently. To avoid this, consumers must immediately cease use and remove all circumvention devices and delete all unauthorized or pirated software from their PlayStation 3 systems. Circumvention devices and game piracy damage our industry and can potentially injure the online experience for you, our loyal PlayStation customers, via hacks and cheats. Many PlayStation.Blog readers have asked how we intend to deal with these incidents that they have been reading about in the gaming press, and this is our initial response. By identifying PlayStation 3 systems that breach our guidelines and terminating their ability to connect to PlayStation Network, we are protecting our business and preserving the honest gameplay experiences that you expect and deserve. Rest assured, this message does not apply to the overwhelming majority of our users who enjoy the world of entertainment PlayStation 3 has to offer without breaching the guidelines detailed above, and we urge you to continue doing so without fear. Sony starts sending out warning emails, telling people that they will be banned if they are found to be using a jailbreak/hacking device. Sony release a new TOS(terms Of Service). zembor0 release a tool to aid in the creation of boot logo’s for the PS3. Team Rebug, release a tool called xReg Plus, which helps you restore you DLC after you format the HDD. GeoHot sets up a legal defence fund, to help him with his legal costs fighting sony. PS3HaX member FirebirdTA01 posts an article, which he calls “Summary of Sony’s Legal Action since PS3 Hacks and Your Rights.”, go read it here, it is worth it. PS3HaX moderator madshaun1984 releases his improved version of Linux for 3.55 MFW, you can read about it here. Team Rebug release Coldboot Installer and 3.56 Version Spoofer. graf_chokolo has his home raided by police, he releases all his work on the internet, which becomes known as the “Hypervisor Bible”, you can read about it here. Sees the release of the Playstation File System Libraries, which allows the ability to implement NTFS support into homebrew. Sony has DMCA remove all ps3 hack related code from Gitorious. Back 🙂 I don’t have a PC at home now guys, so i will post here only when i’m able. I will try to answer all your questions about HV and installing Linux. But expect some delays because as i said i don’t have access to the Internet all the time. i don’t care about those threats with jail and high money penalties, btw, SONY wants about 750.000 euros from me if i don’t cooperate 🙂 They don’t know me at all 🙂 I don’t care about it and they might double it 🙂 The higher is the sum the higher gets my motivation 🙂 They don’t understand what makes me tick. Money and even my life doesn’t mean to me very much without knowledge. I have a scientific mind and the knowledge is food to my brain. Without HV, Linux and FreeBSD kernel hacking my life is meaningless. for more knowledge that i cannot control it anymore. I need knowledge and research, it has a huge meaning in my life. Jail or even death cannot hold it back anymore. And to prove it, i will reopen right now my HV reverse engineering page 🙂 And i will post my latest findings about Update Manager and BD drive here. Most of you know already that i was able to update CORE OS from Linux. And on the last weekend i tries to hel some PS3 devs with BD drive authentication and discovered some interesting stuff about it which i will post here. And please guys, could someone post here a link to the latest version of my cloned Linux kernel. I need it. The last week i implemnted a updater for Linux and it was finished but the police got first before i could upload it. But do not fear, i have everything in my head 🙂 I can write it down again and show you how it works. GeoHot has another interview, this time on The Alyona Show, for Russia Today. kmeaw and kha0S change the name of their version of AsbestOS, to BootOS, due to complaints by fail0verflow. Version 2.01 of BootOS is released. As many of you already know, 2 days ago his house was raided by the German police. Talk about a guy who clearly had no involvement at all with piracy, cheating, or the things Sony claims to care about. Do you want to know what he has that enrages the suits at Sony so much? Talent. Some people call me immature, and you know what, they are probably right. Some call me stubborn, and they are right too. But this pales grossly in comparison to Sony, who is so butthurt over the PS3 being hacked they they are blinded by rage and incompetence. A question, how many people do you think knew or cared on January 10 about all this? Maybe a couple hundred thousand? Under a percent of your market share. And these are geeks, who frankly aren’t going to change their content purchasing habits based on the news. These are the kind of people who really are hacking their PS3 just for the sake of doing it, just cause it’s cool. The kind of people who are telling you the truth when they say they really did just hack their PS3 to run Linux. Or they are diehard pirates who never would have bought the games anyway, you know the type. Now fast forward to February 25. Consistently, the top Sony related news article is about the PS3 being hacked. And the causal gamer comes along and sees, oh cool, the PS3 has been hacked, now I don’t have to buy games. With a few google searches, they come across stuff that I or graf_chokolo had nothing at all to do with. They install it and hit the torrent sites. Hell, I was on a political news show last night, you think those people ever would have heard about this? Just imagine what the third party devs are thinking. The PS3 is hacked forever and Sony can’t do anything but fire away at scapegoats. Great confidence boost. This grand show against people who aren’t even pirates has to be one of the worst corporate moves in recent history, perhaps even as dumb as the rootkit fiasco. Your competition fixes the problem technically and moves on. They want it to stay quiet. And as far as sending a message to “evil” hackers goes, it really isn’t working. Just read the writings of graf_chokolo. They’ll never understand people like us. They are scared, as they rightfully should be. We built your PS3. We built this world. We are not mindless consumers. It is us with the brains and curiosity, not you with the guns, jails, suits, titles, and dollars. And the truth is, if all of you disappeared tomorrow, the world would continue on fine. Good luck surviving without people like graf_chokolo. PS3HaX member/dev facanferff releases a tutorial on how to get on PSN with a banned console, you will find that tutorial here. EU customs are forced to seize PS3 consoles in the Netherlands, due to a patent dispute between Sony and LG. New games appear that need firmware 3.56, unfortunately these games were leaked early and the pirates were able to patch and play them. Sony granted permission to view the IP’s of those that visited GeoHots site, read about it here. EmersonS35 releases version 2 of his PS3 Toolkit, you can check it out here. Team Hades release CVOS v3.1 BETA, a tool to help unbrick the PS3, read about it here. System security has been improved. Allows PlayStation Plus subscribers to store up to 150 MB or 1000 game save data files (whichever comes first) online. This includes ‘copy-prohibited game data’. Such data is restorable once every 24 hours. Now allows a choice of 10, 20, or 30 minute power save feature for automatically turning off controller. PS3ita 3.55 MFW is released, which gives full PSN access, without messing around with any tools, tutorial here. Dutch police have seized several thousand PlayStation 3s at Sony’s biggest European warehouse in the latest stage of its acrimonious patent battle with LG. LG has won a court order enabling it to seize all new PS3 across the Netherlands – including those already in Dutch homes – in a dispute that centres on Sony’s allegedly infringing use of Blu-ray technology belonging to LG. The injunction means that LG is tightening the net on PS3s in Europe, having already ordered customs officers to seize thousands of the consoles last week. Sony will fight to have the blockade lifted at an emergency hearing in the Hague’s civil court of justice tomorrow. LG argues that Sony PS3s infringe a number of its patents relating to playback of Blu-ray discs. The Korean company has been granted an investigation into the PS3?s Blu-ray use by the US international trade commission, after seeking a “permanent exclusion order … excluding entry into the United States” of the games console. Tomorrow’s court battle will be one of the first times the Asian giants have come head to head in patent disputes stretching almost seven years. LG is likely to apply for the consoles to be destroyed, while Sony will apply for the blockade to be lifted. A court judgment on what happens next could be returned tomorrow or in the coming days. Customs officials at Rotterdam and Schiphol, the main import points for PS3s for both the UK and wider Europe, are understood to have extended a blockade on two Sony shipments made last week. Sony, which imports about 100,000 PS3s into Europe each week, is attempting to get all the restrictions lifted. If Sony is found to have infringed LG patents, it could be forced to compensate the South Korean manufacturer for each PS3 it has sold around the world, which could cost hundreds of millions of pounds. A spokesman for Sony said: “Sony was notified at the end of February by customs authorities in the Netherlands that an inspection would be made into imports of [PlayStation 3s]. We believe this is due to a petition made by LG Electronics, alleging that Sony may be infringing LG patents related to Blu-ray technologies. Sony release firmware 3.60, this adds cloud based game saves saving. Team Rebug release 3.60 Version Spoofer. Guys, i never wanted to take money from anybody for my work. And i always shared my work and code with PS3 developers and community. Recently i was working on bringing Linux to PS3 back, as you all know, unfortunately SONY managed to stop me. Many of you offered donations to help me continue my work and i always declined as you know. But now i really need your help and support in this fight with SONY. Please help me to pay my legal bills which are immensely because i cannot pay them on my own. Please donate as much as you can and want. And to answer your question “What happens with the remaining money ?”, i intend to give it to CCC club so the club could help other guys like me which get sued by SONY or give it all to some charity organization. I give you my word on that and you know that i keep my word. Is the court case between LG and Sony, Sony wins lifting the restrictions on its consoles, read more about it here. git-hacks.com is created, it is part of the DashHacks network, the server being located in Canada give PS3 Scene Devs more freedom with their work without having to worry about Sony shutting them down. Package Manager is a replacement for the standard ? Install Package Files option under ‘Game’ in the XMB and allows for the install and deletion of .pkg files from ‘dev_hdd0/packages’, ‘dev_usb/packages’ and the standard ? Install Package Files locations. In addition to this, your downloaded PSN content will appear under this menu instead of cluttering your ‘Game’ menu with uninstalled content. Mega hiper ultra fantastico Team release details on how to use files to ‘re-marry’ a BD drive, check it out here. Sony wins a subpoena for GeoHots PayPal accounts and gets access to the IP’s of all who visited his blog since 2009. The very first homebrew media center/player created by a dev named andoma is released for PS3, it is dubbed “Showtime”, this is the very first time a PS3 without Linux installed is able to play .MKV files, it plays many other files, like SWF, FLV and all the usual avi files, it also does streaming of live TV, check information on it here. Sony changes the 3.60 authentication, of the Playstation Network, blocking all PSN bypass tools like f**kPSN and the MFW that enabled it. Court papers are released showing that GeoHot petitions the courts for a protective order, you can read about that here. EA pull the Crysis 2 demo from the PSN store, due to connection issues. A hacker/developer gets Microsoft’s Kinnect working on the PS3. graf_chokolo manages to fully decrypt the Ps3’s internal HDD. Factually, it’s true I’m in South America, on a vacation I’ve had planned and paid for since November. I mean, it is Spring break; hacking isn’t my life. Rest assured that not a dime of legal defense money would ever go toward something like this. And of course Townsend loves the idea of painting me as an international fugitive. I have been in contact with my lawyers almost every day; I would not let the case suffer. That said, I also won’t let this ridiculous lawsuit run my life either. Then the fearmongerers win. I will be back, I hear it’s hard to come by the Xperia Play down here. libps3gui for PS3 is released, for those wondering what it is, check here. E3diy, the creators of the E3 card reader/jailbreak device, release an update for E3 called “Goldfinger”, it allows for cheating in games. PS3MFW Builder v0.2, the Mod Firmware(MFW) tool is released. graf_chokolo manages to get Linux(Gentoo) running on slim PS3’s internally. PSXScene member “user” releases a homebrew application, that enables Hypervisor debugging from GameOS. Emerson releases version 0.1 of ES35?s Customize,a tool which lets you edit certain aspects about the PS3’s XMB. graf_chokolo releases Petitboot tools which will allow you to dual boot Linux and GameOS on your PS3. Iris Manager, a port of Hermes manager is released. cyberskunk and evilsperm release their second version of 3.41 Rebug MFW and their first version of 3.55 Rebug MFW. Sony/SCEA call for the OtherOS lawsuit to be dismissed. News emerges that the Anonymous Hactivist Group , a well known “activist” group responsible for various online attacks, has decided to wage war on Sony. 1. Sony must allow for end-user modification of the PS3, as was available prior to the 3.21 firmware update. 2. Sony must end any attempts to bring legal action to alter a product they own. 3. Sony must not pursue legal action against any collected IP address. eussNL joined the ranks of the PS3DevWiki. An unknown developer releases a Python Script that enables the user to extract the unique license code embedded in retail and debug PKG’s. zembor0 releases software that enables us to create Custom Dynamic Themes and a tutorial on how to create custom Boot logo’s. graf_chokolo releases GameOS VFlash resizer for Linux + Small Tutorial for installing Linux. jjolano releases a homebrew app, called PSVibe, that helps alleviate those stressful gaming moments. Sony Computer Entertainment America (“SCEA”) and George Hotz (“Hotz”) today announced the settlement of the lawsuit filed by SCEA against Hotz in federal court in San Francisco, California. The parties reached an agreement in principle on March 31, 2011. As part of the settlement, Hotz consented to a permanent injunction. “It was never my intention to cause any users trouble or to make piracy easier,” said Hotz, I’m happy to have the litigation behind me.” Hotz was not involved in the recent attacks on Sony’s internet services and websites. In the action, SCEA accused Hotz of violating federal law by posting online information about the security system in the PlayStation 3 videogame console and software that SCEA claimed could be used to circumvent the security system in the console and allow the playing of pirated videogames. Hotz denies any wrongdoing on his part. Hotz’s motion to dismiss for lack of personal jurisdiction was still pending before the federal court in San Francisco but a preliminary injunction was issued requiring Hotz to take down the postings challenged by SCEA. graf_chokolo gets another visit from people representing Sony. Maises releases LordSELF, an app to edit PS3 SELF/SPRX Files. Robo Hobo releases his ported version of Stella, a Multi-Platform Atari 2600 VCS Emulator. Sony announces that they have sold 50 Million PS3’s. GeoHot donates the remainder of his Court Case donations to the EFF, they received $10,000. graf_chokolo is forced to remove many Sony related articles from his blog. News emerges that Sony are attempting to sue Zoomba again. We’re aware certain functions of PlayStation Network are down. We will report back here as soon as we can with more information. As you are no doubt aware, the current emergency outage is continuing this afternoon and all Sony Online Network services remain unavailable. Our support teams are investigating the cause of the problem, including the possibility of targeted behaviour by an outside party. If the reported Network problems are indeed caused by such acts, we would like to once again thank our customers who have borne the brunt of the attack through interrupted service. Our engineers are continuing to work to restore and maintain the services, and we appreciate our customers’ continued support. For further information, please refer to updates on PlayStation.com, here on PlayStation.Blog and via our @PlayStationEU twitter feed. While we are investigating the cause of the Network outage, we wanted to alert you that it may be a full day or two before we’re able to get the service completely back up and running. Thank you very much for your patience while we work to resolve this matter. Please stay tuned to this space for more details, and we’ll update you again as soon as we can. For further information, please refer to updates on PlayStation.com our @PlayStationEU twitter feed. We’re aware certain functions of PlayStation Network are down. It may be a full day or two before we’re able to get the service completely back up and running. Please stay tuned to this space for more details, and we’ll update you again as soon as we can. Thank you very much for your patience while we work to resolve this matter. Note: When you log into the PlayStation Network, a message may appear which states, “the PlayStation Network has been suspended”. This does not mean that your account has been suspended; it simply means the PlayStation Network has been taken offline. Please wait until the maintenance window has passed before attempting to connect to the PlayStation Network again. We apologize for any inconvenience this may cause. An external intrusion on our system has affected our PlayStation Network and Qriocity services. In order to conduct a thorough investigation and to verify the smooth and secure operation of our network services going forward, we turned off PlayStation Network & Qriocity services on the evening of Wednesday, April 20th. Providing quality entertainment services to our customers and partners is our utmost priority. We are doing all we can to resolve this situation quickly, and we once again thank you for your patience. We will continue to update you promptly as we have additional information to share. Sony’s Playstation Network, its online service for Playstation 3 and its Playstation Portable consoles, suffered from a major outage today; which is on going as of this writting. According to Son’ys blog, the interruption in service may last into the long weekend – for at least another “full day or two”. Sony released a statement through its EU blog, saying that the network outage may be a result of “targeted behaviour by an outside party”, brining in the possibility of cyberattacks. Adding to the confusion is the fact that the message has since been removed. While it could be the case that other Anons have acted by themselves AnonOps wa not related to this incident and takes no responsiblity for it. A more likely explination is that Sony is taking advantage of Anonymous’ previous ill-will towards the company to distract users from the fact the outage is accutally an internal problem with the companies servers. We sincerely regret that PlayStation Network and Qriocity services have been suspended, and we are working around the clock to bring them both back online. Our efforts to resolve this matter involve re-building our system to further strengthen our network infrastructure. Though this task is time-consuming, we decided it was worth the time necessary to provide the system with additional security. We thank you for your patience to date and ask for a little more while we move towards completion of this project. We will continue to give you updates as they become available. Robo Hobo release a DosBox Emulator for the PS3 and ps3cfw releases a tutorial to run Windows95 on the DosBox emulator. Thank you for your patience while we work to resolve the current outage of PlayStation Network & Qriocity services. We don’t have an exact date to share at this moment as to when we will have the services turned on, but are working day and night to ensure it is as quickly as possible. We are currently working to send the following message via email to all of our registered account holders regarding a compromise of personal information as a result of this malicious attack on our servers, so please look for this information via email as well. Please note that we are as upset as you are regarding this attack and are going to proceed aggressively to track down those that are responsible. 3) Quickly taken steps to enhance security and strengthen our network infrastructure by re-building our system to provide you with greater protection of your personal information. We greatly appreciate your patience, understanding and goodwill as we do whatever it takes to resolve these issues as quickly and efficiently as practicable. Although we are still investigating the details of this incident, we believe that an unauthorized person has obtained the following information that you provided: name, address (city, state/province, zip or postal code), country, email address, birthdate, PlayStation Network/Qriocity passwords and login, and handle/PSN online ID. It is also possible that your profile data, including purchase history and billing address (city, state, zip), and your PlayStation Network/Qriocity password security answers may have been obtained. If you have authorized a sub-account for your dependent, the same data with respect to your dependent may have been obtained. While there is no evidence that credit card data was taken at this time, we cannot rule out the possibility. If you have provided your credit card data through PlayStation Network or Qriocity, to be on the safe side we are advising you that your credit card number (excluding security code) and expiration date may also have been obtained. For your security, we encourage you to be especially aware of email, telephone, and postal mail scams that ask for personal or sensitive information. Sony will not contact you in any way, including by email, asking for your credit card number, social security, tax identification or similar number or other personally identifiable information. If you are asked for this information, you can be confident Sony is not the entity asking. When the PlayStation Network and Qriocity services are fully restored, we strongly recommend that you log on and change your password. Additionally, if you use your PlayStation Network or Qriocity user name or password for other unrelated services or accounts, we strongly recommend that you change them, as well. To protect against possible identity theft or other financial loss, we encourage you to remain vigilant to review your account statements and to monitor your credit or similar types of reports. We thank you for your patience as we complete our investigation of this incident, and we regret any inconvenience. Our teams are working around the clock on this, and services will be restored as soon as possible. Sony takes information protection very seriously and will continue to work to ensure that additional measures are taken to protect personally identifiable information. Providing quality and secure entertainment services to our customers is our utmost priority. Please check www.eu.playstation.com/psnoutage should you have any additional questions. Sony Network Entertainment Europe Limited (formerly known as PlayStation Network Europe Limited) is a subsidiary of Sony Computer Entertainment Europe Limited the data controller for PlayStation Network/Qriocity personal data. Follow us on Twitter @PlayStationEU for live updates and read the FAQ at eu.playstation.com/psnoutage for further information. Thank you for your patience while we work to resolve the current outage of PlayStation Network & Qriocity services. We are currently working to send a similar message to the one below via email to all of our registered account holders regarding a compromise of personal information as a result of an illegal intrusion on our systems. These malicious actions have also had an impact on your ability to enjoy the services provided by PlayStation Network and Qriocity including online gaming and online access to music, movies, sports and TV shows. We have a clear path to have PlayStation Network and Qriocity systems back online, and expect to restore some services within a week. We’re working day and night to ensure it is done as quickly as possible. We appreciate your patience and feedback. Quickly taken steps to enhance security and strengthen our network infrastructure by re-building our system to provide you with greater protection of your personal information. Although we are still investigating the details of this incident, we believe that an unauthorized person has obtained the following information that you provided: name, address (city, state, zip), country, email address, birthdate, PlayStation Network/Qriocity password and login, and handle/PSN online ID. It is also possible that your profile data, including purchase history and billing address (city, state, zip), and your PlayStation Network/Qriocity password security answers may have been obtained. If you have authorized a sub-account for your dependent, the same data with respect to your dependent may have been obtained. While there is no evidence at this time that credit card data was taken, we cannot rule out the possibility. If you have provided your credit card data through PlayStation Network or Qriocity, out of an abundance of caution we are advising you that your credit card number (excluding security code) and expiration date may have been obtained. For your security, we encourage you to be especially aware of email, telephone, and postal mail scams that ask for personal or sensitive information. Sony will not contact you in any way, including by email, asking for your credit card number, social security number or other personally identifiable information. If you are asked for this information, you can be confident Sony is not the entity asking. When the PlayStation Network and Qriocity services are fully restored, we strongly recommend that you log on and change your password. Additionally, if you use your PlayStation Network or Qriocity user name or password for other unrelated services or accounts, we strongly recommend that you change them, as well. U.S. residents are entitled under U.S. law to one free credit report annually from each of the three major credit bureaus. To order your free credit report, visit www.annualcreditreport.com or call toll-free (877) 322-8228. We have also provided names and contact information for the three major U.S. credit bureaus below. At no charge, U.S. residents can have these credit bureaus place a “fraud alert” on your file that alerts creditors to take additional steps to verify your identity prior to granting credit in your name. This service can make it more difficult for someone to get credit in your name. Note, however, that because it tells creditors to follow certain procedures to protect you, it also may delay your ability to obtain credit while the agency verifies your identity. As soon as one credit bureau confirms your fraud alert, the others are notified to place fraud alerts on your file. Should you wish to place a fraud alert, or should you have any questions regarding your credit report, please contact any one of the agencies listed below. You may wish to visit the web site of the U.S. Federal Trade Commission at www.consumer.gov/idtheft or reach the FTC at 1-877-382-4357 or 600 Pennsylvania Avenue, NW, Washington, DC 20580 for further information about how to protect yourself from identity theft. Your state Attorney General may also have advice on preventing identity theft, and you should report instances of known or suspected identity theft to law enforcement, your State Attorney General, and the FTC. For North Carolina residents, the Attorney General can be contacted at 9001 Mail Service Center, Raleigh, NC 27699-9001; telephone (877) 566-7226; or www.ncdoj.gov. For Maryland residents, the Attorney General can be contacted at 200 St. Paul Place, 16th Floor, Baltimore, MD 21202; telephone: (888) 743-0023; or www.oag.state.md.us. We thank you for your patience as we complete our investigation of this incident, and we regret any inconvenience. Our teams are working around the clock on this, and services will be restored as soon as possible. Sony takes information protection very seriously and will continue to work to ensure that additional measures are taken to protect personally identifiable information. Providing quality and secure entertainment services to our customers is our utmost priority. Please contact us at 1-800-345-7669 should you have any additional questions. There’s a difference in timing between when we identified there was an intrusion and when we learned of consumers’ data being compromised. We learned there was an intrusion April 19th and subsequently shut the services down. We then brought in outside experts to help us learn how the intrusion occurred and to conduct an investigation to determine the nature and scope of the incident. It was necessary to conduct several days of forensic analysis, and it took our experts until yesterday to understand the scope of the breach. We then shared that information with our consumers and announced it publicly this afternoon. Golem.de: Did you actually have a Playstation 3 – and what you mainly use the console? Alexander Egorenkov: I had many PS3 consoles, three own and was loaned to me recently. All were taken away from me. I use the Playstation 3 only for development and reverse engineering, games for the PS3 I do not, I also do not care for it. Games I find boring, reverse engineering and programming makes my hand a lot of fun. GameOS I hardly use, mainly on the thought of Linux on the PS3, the development of new Linux kernel drivers for PS3. Golem.de: How do you see yourself as a hacker, gamer, coder, Internet activist, …? Egorenkov: I see myself primarily as a coder, reverse engineer and then maybe a bit of a hacker. Above all, I am very interested in technical knowledge, which is also the reason why I started reverse engineering on the PS3. It makes me quite simply a lot of fun to independently figure out something new, especially about the workings of an operating system and hypervisor. Golem.de: Are companies like Sony, but for example, Nintendo or Microsoft or Google, in your view evil? What practices of the companies you are particularly disturbing? Egorenkov: In all of these groups bothers me that they are very monopolistic. They are of the opinion that the purchase of their products somehow binds to them. I like it not entirely, if anyone thinks that – only because I buy something from him – he has any rights to me, or that he can tell me where it’s at. And Sony is trying. And as Sony has removed the “OtherOS” support, the company has not asked its customers whether they find the good or not. Why should I listen to Sony when they tell me to stop? Golem.de: What do you find so bad about that Sony has disabled the “Other OS” option? Egorenkov: I think many would I have Linux or FreeBSD on the Playstation 3 because it is much better suited to programming as GameOS. GameOS is only good for playing with Linux, however it is easy to develop new programs for the PS3 and so extend the PS3’s new functionality to exploit the full power of the PS3. GameOS not allow us and is not as mature as Linux by far. Golem.de: How do you see the current rules to protect intellectual property, say for example in terms of copy protection systems? Egorenkov: I find that something is unfortunately very much abused by large corporations like Sony. Sony has money and power and believes it can do with it what they want. Unfortunately that is the reality. I see things differently. 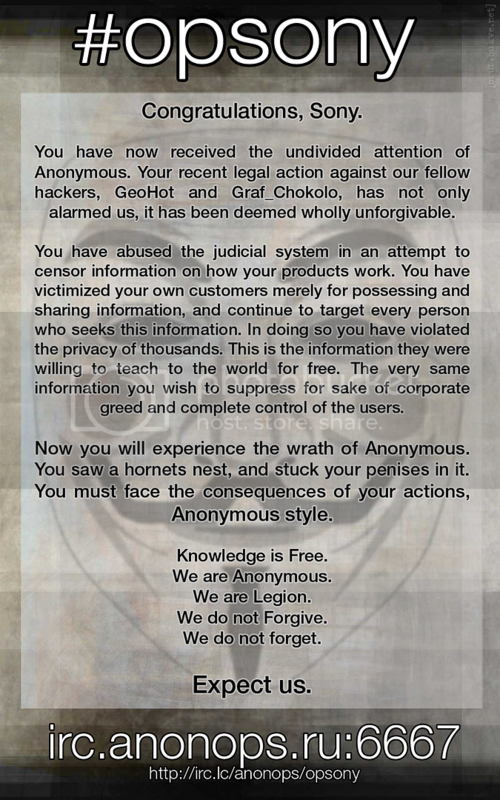 Golem.de: What do you think about the actions of Anonymous who are fighting on your behalf against Sony? Egorenkov: I am Anonymous and all other very grateful for the support they offer me. If we ever give in without a fight, we soon large corporations like Sony will make your life a living hell and tell us all where it’s at. This one may not allow them, and I am also willing to almost stand for my principles. The recent PSN attacks have shown us how incompetent and negligent Sony deal with our private data. Many blame the hackers mind, but the truth is that Sony is the main culprit. Sony is not responsible for our private data! Golem.de: Would you wish for more support from the community, and in what form? Egorenkov: I wish especially that more people would show some backbone. Then Sony could no longer afford everything. Golem.de: Can you tell us a bit about yourself: What do you do, what are your interests? Egorenkov: Professionally I am working as a programmer. But reverse engineering and programming is not all that interested me. I like to read classic literature and love going to the theater, the opera and the ballet. Click here to read the original. Robo Hobo releases PrBoom, a port of Doom for the PS3. Kazuo Hirai, Chairman of SCEA, receives a letter from a sub committee of the United States House Of Representatives, they want questions about the PSN problem,. Tokyo, May 1, 2011 – Sony Computer Entertainment (SCE) and Sony Network Entertainment International (SNEI, the company) announced they will shortly begin a phased restoration by region of PlayStation®Network and Qriocity™ services, beginning with gaming, music and video services to be turned on. The company also announced both a series of immediate steps to enhance security across the network and a new customer appreciation program to thank its customers for their patience and loyalty. The company also expedited an already planned move of the system to a new data center in a different location that has been under construction and development for several months. In addition, PS3 will have a forced system software update that will require all registered PlayStation Network users to change their account passwords before being able to sign into the service. As an added layer of security, that password can only be changed on the same PS3 in which that account was activated, or through validated email confirmation, a critical step to help further protect customer data. The company is conducting a thorough and on-going investigation and working with law enforcement to track down and prosecute those responsible for the illegal intrusion. While there is no evidence at this time that credit card data was taken, the company is committed to helping its customers protect their personal data and will provide a complimentary offering to assist users in enrolling in identity theft protection services and/or similar programs. The implementation will be at a local level and further details will be made available shortly in each region. The company will also rollout the PlayStation Network and Qriocity “Welcome Back” program, to be offered worldwide, which will be tailored to specific markets to provide our consumers with a selection of service options and premium content as an expression of the company’s appreciation for their patience, support and continued loyalty. Each territory will be offering selected PlayStation entertainment content for free download. Specific details of this content will be announced in each region soon. All existing PlayStation Network customers will be provided with 30 days free membership in the PlayStation Plus premium service. Current members of PlayStation Plus will receive 30 days free service. Music Unlimited powered by Qriocity subscribers (in countries where the service is available) will receive 30 days free service. Additional “Welcome Back” entertainment and service offerings will be rolled out over the coming weeks as the company returns the PlayStation Network and Qriocity services to the quality standard users have grown to enjoy and strive to exceed those exceptions. SNEI will continue to reinforce and verify security for transactions before resuming the PlayStation®Store and other Qriocity operations, scheduled for this month. ThatOtherDev releases a homebrew game called Goodbye World. Our ongoing investigation of illegal intrusions into Sony Online Entertainment systems has discovered that hackers may have obtained personal customer information from SOE systems. We are today advising you that the personal information you provided us in connection with your SOE account may have been stolen in a cyber-attack. Stolen information includes, to the extent you provided it to us, the following: name, address (city, state, zip, country), email address, gender, birthdate, phone number, login name and hashed password. Customers outside the United States should be advised that we further discovered evidence that information from an outdated database from 2007 containing approximately 12,700 non-US customer credit or debit card numbers and expiration dates (but not credit card security codes) and about 10,700 direct debit records listing bank account numbers of certain customers in Germany, Austria, Netherlands and Spain may have also been obtained. We will be notifying each of those customers promptly. There is no evidence that our main credit card database was compromised. It is in a completely separate and secured environment. We had previously believed that SOE customer data had not been obtained in the cyber-attacks on the company, but on May 1st we concluded that SOE account information may have been stolen and we are notifying you as soon as possible. 3) Quickly taken steps to enhance security and strengthen our network infrastructure to provide you with greater protection of your personal information. For your security, we encourage you to be especially aware of email, telephone, and postal mail scams that ask for personal or sensitive information. Sony will not contact you in any way, including by email, asking for your credit card number, social security number or other personally identifiable information. If you are asked for this information, you can be confident Sony is not the entity asking. When SOE’s services are fully restored, we strongly recommend that you log on and change your password. Additionally, if you use your Station or SOE game account name or password for other unrelated services or accounts, we strongly recommend that you change them, as well. We are committed to helping our customers protect their personal data and we will provide a complimentary offering to assist users in enrolling in identity theft protection services and/or similar programs. The implementation will be at a local level and further details will be made available shortly in regions in which such programs are commonly utilized. We thank you for your patience as we complete our investigation of this incident, and we regret any inconvenience. Our teams are working around the clock on this, and services will be restored as soon as possible. Sony takes information protection very seriously and will continue to work to ensure that additional measures are taken to protect personally identifiable information. Providing quality and secure entertainment services to our customers is our utmost priority. Please contact us at 1 (866) 436-6698 should you have any additional questions. respect to a dependent may also have been obtained. Sony is not able to say whether user credit card or debit card information was also taken. offered is 30 or 60 day free memberships on its PlayStation network. advice Canadian users about credit reports. the costs of credit monitoring services and fraud insurance coverage for two years. Kazuo Hirai, Chairman of the Board of Directors of Sony Computer Entertainment America, submitted written answers to questions posed by the subcommittee about the large-scale, criminal cyber-attack we have experienced. We wanted to share those answers with you. Act with care and caution. Provide relevant information to the public when it has been verified. Take responsibility for our obligations to our customers. Work with law enforcement authorities. Sony has been the victim of a very carefully planned, very professional, highly sophisticated criminal cyber attack. By April 25, forensic teams were able to confirm the scope of the personal data they believed had been taken, and could not rule out whether credit card information had been accessed. On April 26, we notified customers of those facts. As of today, the major credit card companies have not reported any fraudulent transactions that they believe are the direct result of this cyber attack. Protecting individuals’ personal data is the highestpriority and ensuring that the Internet can be made secure for commerce is also essential. Worldwide, countries and businesses will have to come together to ensure the safety of commerce over the Internet and find ways to combat cybercrime and cyber terrorism. We are taking a number of steps to prevent future breaches, including enhanced levels of data protection and encryption; enhanced ability to detect software intrusions, unauthorized access and unusual activity patterns; additional firewalls; establishment of a new data center in an undisclosed location with increased security; and the naming of a new Chief Information Security Officer. PlayStation Plus premium subscription service; 30 days of free service for Music Unlimited subscribers; and extending PlayStation Plus and Music Unlimited subscriptions for the number of days services were unavailable. We are working around the clock to have some PlayStation Network services restored and we’ll be providing specific details shortly. We hope this update is helpful to you, and we will continue to keep you posted as we work to restore our network and provide you with both the entertainment and the security you deserve. underscored recently by massive data breaches at Epsilon and Sony. Robbery” of cyber attacks. And the “take” keeps going up. million accounts now in jeopardy. credit card number and hits “enter.” E-commerce is a vital and growing part of our economy. We should take steps to embrace and protect it – and that starts with robust cyber security. decision by both Epsilon and Sony not to testify today. This is unacceptable. I know this has been a frustrating time for all of you. Let me assure you that the resources of this company have been focused on investigating the entire nature and impact of the cyber-attack we’ve all experienced and on fixing it. We are absolutely dedicated to restoring full and safe service as soon as possible and rewarding you for your patience. We will settle for nothing less. To date, there is no confirmed evidence any credit card or personal information has been misused, and we continue to monitor the situation closely. We are also moving ahead with plans to help protect our customers from identity theft around the world. A program for U.S. PlayStation Network and Qriocity customers that includes a $1 million identity theft insurance policy per user was launched earlier today and announcements for other regions will be coming soon. As we have announced, we will be offering a “Welcome Back” package to our customers once our PlayStation Network and Qriocity services are up and running. This will include, among other benefits, a month of free PlayStation Plus membership for all PSN customers, as well as an extension of subscriptions for PlayStation Plus and Music Unlimited customers to make up for time lost. As a company we — and I — apologize for the inconvenience and concern caused by this attack. Under the leadership of Kazuo Hirai, we have teams working around the clock and around the world to restore your access to those services as quickly, and as safely, as possible. I know some believe we should have notified our customers earlier than we did. It’s a fair question. As soon as we discovered the potential scope of the intrusion, we shut down the PlayStation Network and Qriocity services and hired some of the best technical experts in the field to determine what happened. I wish we could have gotten the answers we needed sooner, but forensic analysis is a complex, time-consuming process. Hackers, after all, do their best to cover their tracks, and it took some time for our experts to find those tracks and begin to identify what personal information had — or had not — been taken. As a result of what we discovered we notified you of the breach. Our investigation is ongoing, and we are upgrading our security so that if attacks like this happen again, our defenses will be even stronger. In the last few months, Sony has faced a terrible earthquake and tsunami in Japan. But now we are facing a very man-made event – a criminal attack on us — and on you — and we are working with the FBI and other law enforcement agencies around the world to apprehend those responsible. In the coming days, we will restore service to the networks and welcome you back to the fun. I wanted to personally reach out and let you know that we are committed to serving you to the very best of our ability, protecting your information better than ever, and getting you back to what you signed up for – all the games and great entertainment experiences that you expect from Sony. SAN DIEGO (CN) – A former Navy pilot claims the video game “Oblivion: The Elder Scrolls IV” gave him a grand mal seizure that caused him to lose his flight status. John Ryan McLaughlin says he was playing the game when its strobe lights gave him “a grand mal seizure for the first time in his life,” causing excruciating pain and breaking a bone. McLaughlin, a former F-18 pilot, says the seizures caused him to permanently lose his flying status. The game is made by lead defendant Bethesda Softworks, of Rockville Md. McLaughlin also sued its corporate parent, Zenimax Media, and Sony Computer Entertainment, which makes the Playstation 3 system on which he was playing the game when he was affected, on March 28, 2010. He seeks punitive and damages for negligence, breach of warranty, and product liability. He is represented by Dennis Minna of Santa Ana. Similar problems were reported in Japan in 1997, when fast, repetitive strobelike effects in the “Pokemon” cartoon series were blamed for sending hundreds of children to hospitals with seizures and seizure symptoms. Bloomberg reports that a hired Amazon Cloud Server was responsible for PSN being hacked. Users are required to change their PlayStation Network password. SCEA reveal their “Welcome Back” package, this is to say sorry for their terrible mistake. Everyone who was a PSN user before the service went down, will also receive 30 days free PSN Plus(PSN+), those already on PSN+ will receive 60 days. OtherOS Prep Tool is used to prepare your system vflash and install petitboot ready to install Linux. IT DOES NOT INSTALL LINUX. For tutorials and videos on how to install Linux head over to gitbrew.org. OtherOS Prep Tool is based off of graf_chokolo’s and glevand’s source and is a one or two step solution to getting petitboot up and running and on your way to installing Linux on to USB or PS3 Hard Disk. At the moment it only supports 3.55 but we will add support for lower firmware soon. Most of these breaches go unreported by companies. Forty-three percent (of companies) notify victims within a month. We reported in a week. You’re telling me my week wasn’t fast enough? Hot on the heels of Sir Howard Stringer’s speech on the PSN fiasco, comes a new exploit affecting the login/password process on the Playstation websites, you can read about it here. PS3 Dev Robo Hobo releases a PS3 port of the ZX Spectrum emulator, Fuse. The Humble Homebrew Collection is an initiative that aims to convince Sony to provide us with a legitimate and official way to create homebrew applications for the consoles that we own. We are providing you with a free homebrew game that aims to be polished and look professionally made which includes 33 very good and addictive puzzle games. We’ve tried to make this homebrew games collection as good as possible so that even the anti-homebrew purists will be jealous of it. Homebrew does not equal piracy, and this is proof of it. These games are all free and are released under the MIT license. You are free to download these games for the platform of your choice, whether it’s on a jailbroken PS3, Linux, Windows, Mac or Android. This Homebrew game collection is a port of Simon Tatham’s Portagle Puzzle Collection to the Playstation 3 system and it includes 33 puzzle games. More games are being written and this collection will only increase with time. This is one of the first homebrew games that are released on the PS3 which are above the “proof of concept” status and is not yet another backup manager, FTP server or a port of an existing emulator. This homebrew game is still in active development and will continue to receive regular updates. The TODO list has many items on it and it will continue to improve for your enjoyment. The main purpose of this website it to serve as a petition against Sony’s unjust behavior towards their customers. You are encouraged to sign the petition, donate to the developers or you can simply download the games. The choice is yours. If you wish to do so, you may also donate to the developers of this homebrew application, as well as to the EFF, which helps defend our rights in this digital age. It is time to vote with your money, boycott Sony, request your legal homebrew and request your freedom and let them know that they have much to gain by giving us access to the homebrew that we deserve. Let Sony know that, as a customer, you want homebrew games, you want to see the real purpose of the Copyright Law used properly: To encourage creativity and innovation. Let them know that, as a customer, you are willing to pay for quality homebrew and that if they wanted to, they can get a share of that money. After all, all they care about is money! To download the collection and sign the petition, visit the official site here. The guys at Gitbrew manage to get Dualboot working on 256MB Nand PS3’s. A PS3HaX.net member baileyscream posted a tutorial he had written, on how to install two extra USB ports, to the rear of the PS3, to view that tutorial, check here. Sony announces that it is working on a successor to the PS3. Built in speakers with volume controls with 2.5mm headphone jack. The stock PS3 was a 40gb SKU (there was no PS3 slim when I started the project). Tokyo, May 31, 2011 – Sony Corporation and Sony Computer Entertainment (SCE) announced today that Sony Network Entertainment International (SNEI, the company) will fully restore all PlayStation®Network services in the Americas, Europe/PAL territories and Asia, excluding Japan, Hong Kong, and South Korea by the end of this week. The company will also resume Music Unlimited powered by Qriocity™ for PlayStation®3 (PS3®), PSP® (PlayStation®Portable), VAIO and other PCs. Details for Japan, Hong Kong, and South Korea as well as the remaining services on Qriocity will be announced as they become available. Customers will be able to purchase and download games and video content from the PlayStation®Store on PS3 or PSP. In addition, consumers will have full access to Music Unlimited powered by Qriocity through PS3, PSP, VAIO and other PC’s. Service restoration of Video on Demand powered by Qriocity™ and Music Unlimited powered by Qriocity for a variety of network-enabled Sony devices will be announced later. The company will be offering customers a “Welcome Back” package of services and premium content to all registered PlayStation Network* and Qriocity account services. The details of this program will continue to be detailed regionally. * Only available for those countries with access to PlayStation®Store. We will update the PlayStation Blog when the PlayStation Store is once again open for business. PS3 Hardware Modder KillerBug introduces PS3 Hardware Mod Firmware, to read more about it, visit his site here. The PlayStation Store is back online and thank you everyone for your patience. You will notice a huge lineup of new downloadable games, demos, add-on content, themes, avatars and videos. Also, PlayStation Plus has been updated with new full game trials, free games and DLC, free avatars and even more discounts. You may have noticed that the content promised as part of the Welcome Back offer is not yet live. It is currently in the final stages of testing and will be available to download soon; we’ll be sure to let you know when. The next PlayStation Store and PlayStation Plus update will be this Friday, June 3, and then we will roll right into some special publishes starting next week for E3 (so be sure to check back daily!). In the meantime, check out all the new downloadable content on PlayStation Store(Check Source). PS3 Dev CrashSerious, releases a pre configured PSL1GHT Linux virtual machine, making it easier for people to get involved in creating homebrew for the PS3. PS3HaX member, mc_ releases a PS3 Homebrew game, the game FreeDroid Classic, is a port of the C64 game Paradroid. The PSN welcome back package is now live, though it starts of with problems. PS3HaX member and developer samson, releases WinDos3.1 beta, which is Windows 3.1, running on the PS3. Killerbug releases a second version of his PS3 Hardware Mod Firmware. D0zs releases an aplication which is aimed at letting the user create PKG’s for their PS3’s with ease, you can read about it here. KaKaRoTo releases a port Free Heroes 2 for the PS3, he adds it as part of his PS3 Humble Homebrew Collection. The guys at Gitbrew update OtherOS++ to work on all PS3 models. Improves the system stability for some PS3 format software. [Save Data Utility (minis)] has been renamed [Save Data Utility (minis/PSP)]. The Spanish police said Friday that they had arrested three suspected computer hackers in connection with recent cyberattacks on Sony’s PlayStation network as well as corporate and government Web sites around the world. In a statement, the police said that with the arrests, they had dismantled the local leadership of the shadowy international network of computer hackers, called Anonymous, that has claimed responsibility for a wide variety of attacks. According to the statement, Anonymous is made up of people from various countries organized into cells that share common goals. The activists operate anonymously, but in a coordinated fashion. One of the “hacktivist” detainees, the police said, had harbored a computer server in an apartment in the northern port city of Gijon, from which the group attacked the Web sites of the Sony PlayStation online gaming store. It also was used in coordinated cyberattacks against two Spanish banks, BBVA and Bankia, the Italian energy company Enel, as well as government sites in Spain, Egypt, Algeria, Libya, Iran, Chile, Colombia and New Zealand, the police said. The police provided little information about the suspects. It was not immediately clear if the group had been the sole, or even the main, perpetrator of the recent attacks on Sony. About a dozen Sony Web sites and services around the world have been hacked, with the biggest breaches forcing the Tokyo-based company to shut down its popular PlayStation Network for a month beginning in April. The company has acknowledged that hackers compromised personal data for tens of millions of user accounts. Earlier this month, a separate hacker collective called Lulz Security said it had breached a Sony Pictures site and released vital source codes. Gitbrew update all their tutorials, regarding installation of Linux on PS3, with support for Fedora, Debian And Ubuntu. Slynk’s releases a PS3 IDA Tutorial and information on NPDRM, read about it here. samson releases a second version of WinDos 3.1, as well as some improvements, it also adds support for those Ps3 owners on firmware 3.41. A developer by the name of bgK releases a test version of a ScummVM port he is working on, for the PS3. Debug versions of Sonys 3.50/3.60 PS3 firmware are leaked. Multi console developer Scognito releases his homebrew game Scogger on PS3, you can read about it here and grab it here. The guys at Gitbrew release a Cluster Computing app for the PS3 called OpenCLit, read about it here. Hi guys, no money left anymore. Going to jail soon probably because i cannot pay court costs. But i’m ready to stand up for everything i said and go to jail for that too. It’s not important to win, more important is to show them that we are ready to fight, that they cannot scare me off easily. Yeah, i’m ready to go to jail for my believes and my principles. Most of people probably think that all computer and kernel hackers are weak kids, hiding in a cellar, eating pizza whole day, writing software and looking for attention 🙂 Maybe, but that’s NOT me. And i will get out eventually and continue my work. My work means very much to me. Robo Hobo releases a preview version of Mame for the PS3, one of the Emulators many people were looking forward to. News emerges that the Cobra Jailbreak dongle, will also support PS2 ISO’s. Sony reports that it is working on a new PS3 SKU. Spanish developer jaicrab posts information on his blog, regarding a new MFW he is working on, he also posts what appear to be the keys of the Cobra Jailbreak dongle. Slynk releases a tutorial on how to QA flag your PS3, read that tutorial on his blog here. System stability during use of PS3 format software and network services has been improved. News emerges of a new Class Action Law Suit against Sony/SCEA, this is due to the PSN hack. jaicrab release dumps of the Cobra Jailbreak dongle. The guys at Gitbrew release QA Flagging Tools, read about it here. The guys at Gitbrew, post information on how to downgrade your PS3, read the tutorial here. Spanish developer dospiedras1973, releases a method he had been working of for two months, on how to downgrade from 3.6 PS3 firmware and how to fix those consoles bricked by Waninkoko’s MFW, read about it here. Sony release the 3000(3K) model of PS3. The Gitbrew guys via Twitter, state that they have managed to dump the PS3 Bootloader. PS3HaX member Varaques releases her own version of 3.55 MFW, thanks to the awesome MFW tools. The Rebug guys release a new version of their popular hybrid MFW, you can read about it and download it here. Check his site out here for more information. Debug PS3 Firmware 3.66 is leaked. Developer Matercrack, releases a tool, that lets you mess around with the dev_flash files, you can read about it here. PS3Crunch reports of a new new Hardware Flasher for the PS3, is being worked on, this device, which is being called PROGSKEET, enables you to Flash or Dump your PS3, it also lets you downgrade from PS3 firmware 3.56. We continually strive to make PlayStation Network the most innovative console game and entertainment service and that’s why we’re thrilled to announce a three-year, $20 million dollar investment plan to develop PSN exclusive games. Our line of PSN exclusives has had great success with titles such as Joe Danger, Critter Crunch, Flower and the PixelJunk series, and we’re excited to add new and different game experiences to this portfolio of games that can’t be found on any other game console. This investment includes support across both our own network of first-party studios as well as for the Pub Fund, which was first introduced at GDC in 2009. So what does this mean for you as a gamer? It means more unique, fun, innovative, edgy and higher quality game experiences on PSN that you won’t find anywhere else! We are excited for the upcoming PSN exclusive titles that are part of this three-year plan, including Eufloria, Okabu, and Papo & Yo, which recently received several accolades at E3, including Best Puzzle Game by both IGN and GamePro. Under this investment, we’re committed to delivering titles that have innovative gameplay mechanics, vibrant visuals, interesting storylines and an artistic element to interactive entertainment that can only be found on PlayStation Network. PS3HaX moderator BobbyBlunt, releases his version of 3.55 MFW, it is created with PS3HaX members in mind and has PS3HaX moderator Annelies, dynamic PS3HaX theme built in, to read more about it, visit here. To read more, visit the site here. I believe knowledge and information wants to be free. This is why I consider that this project is open-hardware and will be open-source ! Learn what you can and help contribute to making the PS3 scene a better place. PPS: No other hardware (Infectus, Progskeet…) can manage what PNM do. It is quite different than these products. Functions in PNM will be much more advanced. Again, everything will be FREE in some weeks !!! Samson releases his final version of WinDos 3.1, you can grab it here. Compatibility with games and applications using a DH-JFW 341v2 core, this does not mean not being able to play all over now without patching. DH-JFW runs natively games until 3.56 (original disks) without having to upgrade. PS3roar is a port of xroar for X windows, as well as; the Nintendo DS, GPX32, PSP and AMIGA OS4. PS3roar is a Dragon 32 and 64 Computer emulator that runs on a wide variety of platforms, now including the PS3. Due to hardware similarities, PS3roar also emulates the Tandy Colour Computer (CoCo) models 1 & 2. The PS3 port and modifications completed by CrashSerious (me). The PS3 port uses PSL1GHTv2, a free and Open Source SDK for the PS3. PS3roar is a Dragon/Tandy Coco emulator, is a port of xRoar by Ciaran Anscomb. You can read more about it, on his official thread at Homebrew Café. jonrafkind and juvinous release a test version of the open source 2D scrolling game Paintown. News emerges about a PS3 Emulator for PC being worked on, it is at its very early stages and RPCS3 is far from being fully useable. My Name is Snake Plissken. I am Chief Commander of a group known as PMW NATION. Im currently directing our groups development branch into bringing to the PS3 one great First person gaming experience by means of homebrew on Playstation Custom Firmware. we hope to release onto the world a whole new concept in homebrew development on the PS3 by developing an “homebrew engine” that future developers can use to make homebrew with to be used on the PS3. Developers would need a way to install a .pkg onto there PS3s. They would then make homebrew in form of “recourse data” with the Gaming engine’s tool chain. that is then coupled and distributed with the engine. You can read more information on it here. The Cobra Team is proud to present the Cobra 3.0 firmware pack, available from downloads section. In this release we enabled the Cobra USB device on 3.55 via use of our own cfw. Enjoy the release and look forward to many new features to come in future releases. Please be sure to read the updated user manual for detailed instructions on upgrading and usage! * Integrated support to play PS2 ISO’s on CECHC,CECHE, CECHA and CECHB backwards compatible consoles. * Downgrader functionality included free of charge, allowing users to upgrade firmware to and from 3.41 at will. I’m going to be on vacations for 3 weeks. I just wanted to tell you that PNM project will be stopped during this period. But, i’ve some great news for you. The second socket has been validated too. We are not far from our main goal : “jailbreak again the PS3? ! Developer samson releases an IRC client for the PS3. varicela a member of elotrolado.net, post information on a project he has been working on, the modder successfully managed to install a dual Nand on his 40GB PS3, you can read more about it here. uf6667 releases some information about ProgSkeet, you can view that information here. I have traced the Cinavia DRM checks to 4 separate sprx files and after a long time trying to patch these files I have found that 3 of those files are present in the DEBUG (DEX) firmware don’t have the Cinavia DRM checks enabled. Files are videoplayer_util sprx, videoplayer_plugin sprx and videoeditor_plugin sprx. I have successfully copied these 3 sprx files from DEBUG (DEX) FW 341 over to my retail PS3 unit running OFW 341 using dev_blind and Cinavia seems to be now disabled. I’ve confirmed this by playing back a number of Cinavia affected video files. This means that Cinavia is now disabled for all DLNA playback and copying, but Cinavia checks on AVCHD and BD playback are still present with Message Code 3 that mutes the audio as the sprx file with the Cinavia check bdp_plugin sprx is not present in DEX firmware because BD playback is disabled in DEBUG. If someone is able to patch Cinavia out of bdp_plugin sprx this will be solved too. I have created a new task for PS3MFW so this can be easily made part of any new MFW’s as needed. Any FW version that has had the DEX firmware leaked should be able to be used to create a CFW of the same version. eg DEX 3.41 -> MFW 341 or DEX 355 -> MFW 355 etc etc. Don’t use sprx files from different FW versions! See git hacks for change_cinavia_files task source. Big thanks to the KaKaRoTo and REBUG team for their community contributions as this would have never been possible without the knowledge they’ve shared with us. jaicrabs CFW(JFW-DH) goes into beta stages. Dancing Pixel Studios releases an app for Android devices that enables the Sixaxis and DualShock 3 controllers to be used. You can read about it here at their official site. The Commercial Crime Unit of the South African Police Service, raid a house, arresting the occupant called Naseem Ebrahim Motala, in Parktown, Johannesburg, for Jailbreaking PS3’s and selling pirate games. CrashSerious releases his emulator PS3Roar, you can download it here. PS3HaX member DanyL, releases PSheb, what this project does, is implement the Hebrew language on the PS3, something Sony were incapable of doing, read more about it here. ThatOtherPerson, who released many PS3 Homebrew games, releases a new one, called The Unmapped Forest. You can read about it here. Sony update their TOS(Terms Of Service), you can read about it here. [Automatic Download] has been renamed [Automatic Update]. 3D digital photos in MPO format can be viewed in 3D on the XMB and in the [Photo Gallery]. 3D support available when accessing Java-based content on Blu-ray video discs. DTS-HD MA, DTS-HD HR decoding/bit stream output (or lossless audio) supported while playing Blu-ray 3D movies. New “Recommendations” function has been added to the [PlayStation Store] that enables users to share links to items. Users are now able to choose to automatically upload saved games using the features added in version 3.60. Trophies will sync automatically at the time set in [Automatic Update]. The Friends List now sorts alphabetically by default. The [TV] category has been renamed [TV/Video Services]. Added support for the official PS3 Wireless Stereo Headset. Patched out one of the AVP patch bypass exploits. Added Netflix shortcut for users in Mexico under [TV/Video Services]. Sony and LG settle their dispute, all problems with the shipping of PS3 consoles ends. Sony release a Special Edition Tales Of Xillia X Edition PS3. Rogero releases a MFW which fixes a trophy error after downgrading. d0zs releases DOStoPS3, which lets you easily port your own DOS games. ‘Only On PlayStation Network’ is our line of great exclusive games that users can count on to deliver exciting game experiences that can’t be found anywhere else,” said Susan Panico, senior director of PlayStation Network, SCEA. “This strong initial content offering, combined with the day one discounts for PlayStation Plus subscribers and the ‘Spend $60, Get $10 Back’ promotion, makes PlayStation Network the premier destination for digital content. Through a forum post on both PS3HaX and PS3Crunch, rumours start that a new Dongle dubbed Jailbreak 2(JB2) exists, this dongle allows those on 3.55 MFW the ability to play games that require firmwares above 3.56 to play, of course everyone said it was fake. Gitbrew release their Brick Fix method for 3.55 and below. Jailbreak 2 (JB2) Dongle playing 3.6x+ games on FW 3.55. CrashSerious releases “One” a homebrew application that allows PS1 backups to be played. Eurogamer reports that a future PS3 update, will enable remote play features on the PS Vita for all PS3 games. PlayStation Vita is now supported. [PS Vita System] has been added as an option under [Remote Play Settings] → [Register Device]. [Delete PS Vita System’s Backup Files] has been added as a feature under [System Settings]. PlayStation Plus members can now choose which items are updated by the [Automatic Update] feature. The [Saved Data Auto-Upload] option must now be set for each game, unless the feature is turned off completely. [English (United Kingdom)] and [Portuguese (Brazil)] have been added as options under [System Settings] → [System Language]. The [About PlayStation3 (PS3)] feature under [System Settings] has been updated. Health and Safety Information is now displayed during start up. A new Health Information menu has been added to the disc menu for every game. The file overwrite warning has been redesigned and is now also displayed when uploading to the cloud. A [Restore File System] feature has been added to the bootup sequence when there is a system crash. Removed certain characters and smilies from the system dictionary. Upscaler Output and Cinema Conversion are now supported for Blu-ray Disc content. Support for reading metadata of AAC and M4A files (Artist, Track Name, Album, Album Cover, Year, Track Number). [PS Vita System Application Utility] has been added as a feature under [Game]. [Privacy Settings] has been added as a feature under [Account Management], allowing users to control who they receive messages and friend requests from. [PlayStation Plus] is now displayed under [PlayStation Network] for users who are not subscribed to the service. The EFF releases a PDF supporting console modification, including the PS3. News emerges that the courts dismiss the OtherOS case, Sony wins and the consumer loses. naehrwert updates his scetool, adding 32 bit ELF “unselfing. Copyright © 2019, PS3History. Proudly powered by WordPress. Blackoot design by Iceable Themes.